Today we’re going to talk about something we touched on earlier in the 31 Days of Android: Intents. If you’ve been following along, you’ll recall that you used intents when you wanted to go from one Activity in your application to another. This is certainly one common use for intents and might be the only time you use them. However, intents can be used for so much more. In addition to be using to send messages within your application (say if you’re running a service or hosting a broadcast receiver), intents can be used to communicate with other applications. You will see that intents are key to enabling the Android operating system to feature the rich interconnectivity that it does. You can download the sample code we’re going to start with here. Note: Some of the examples won’t work very well on the emulator due to the inability to install other applications. If you have a device I would suggest testing with it. Simply put, intents are messages. More specifically, they are data structures that contain information on an operation to be performed or the description of something that has happened. Typically messages specifying an operation to be performed will be sent to either an Activity or a Service. Messages about something that has happened are usually delivered to Broadcast Receivers. An intent can explicitly declare which component should receive (as is the case when you launch one Activity in your app from another) or it can be open ended. 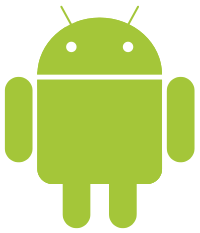 These open ended Intents are one of the ways in which Android enables new applications to become connected to others without everyone needing to go back and update things. We’ll get into more about how the open ended Intents work a little later today. The first line of this code is actually all that is necessary to start ActivityTwo. Here you are creating a new Intent object with the application Context and the class for the Activity that should be started. The call to finish means that the current Activity will be terminated. As such, if you run your app and tap the second button, you’ll be taken to the second Activity and if you hit back, you will back out of the app. If you remove the call to finish and do the same thing, the second Activity will be stacked on top of the first one and when you hit back, you’ll return to the first Activity. Now when you run your app and tap the second button, it will open up and start dialing the number passed in. If you wanted to open up the phone dialer without immediately dialing (i.e. the user would have to hit the dial button) you could change ACTION_CALL to ACTION_DIAL. If you wanted to open up the dialer and not pass any number in, you could use ACTION_DIAL and not use a second parameter. Each application on the list might handle what you pass in a different manner and it’s entirely up to them. Some, such as Facebook (at least as of writing) require you to pass a URL over in the EXTRA_TEXT. You’ll find as you continue to explore intents that there are other values you can send over and other ways you might be able to limit the responding applications. Here Intent.ACTION_VIEW is passed in as the action and the URI of the web site you want to visit is passed in as the data. Intent.ACTION_VIEW is used again to open the maps. This time though, you’re passing in the address as the Uri. 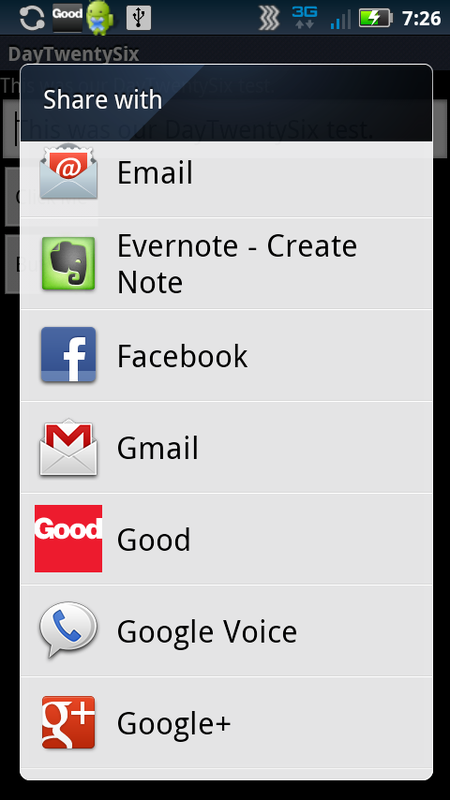 This should demonstrate how specific apps can be with what Intents they are capable of dealing with. Map programs are set to handle addresses and geo coordinates. Browsers are used for URLs. Furthermore, an application can specify URLs that it can handle as well. As an example, if you have the Yelp app installed and fire an intent to view a restaurant at the Yelp web page, Android will ask if you want to view it in the browser or the Yelp app. This is another way that Android makes it possible to interconnect apps without having to go back and change older applications. Here the action is Intent.ACTION_EDIT. You’re passing a specific type that maps to an event and then details for the title, description, and location. You can get the package name for an application by finding it in the Marketplace and looking at the URL. When you start this activity it will take the user to a search page with the results for this app. Now your ActivityTwo is capable of being created within your app and having MyStringValue sent into it, or it can be created via another application sharing to it. If you do decide to create an Intent Filter in your app, make sure you understand if other people are using it before you go and remove it. If someone else designs an application that makes use of your app via intent, it’s poor etiquette to go and break their functionality by altering or removing your filter. This just skims the surface of what is possible with Intents. 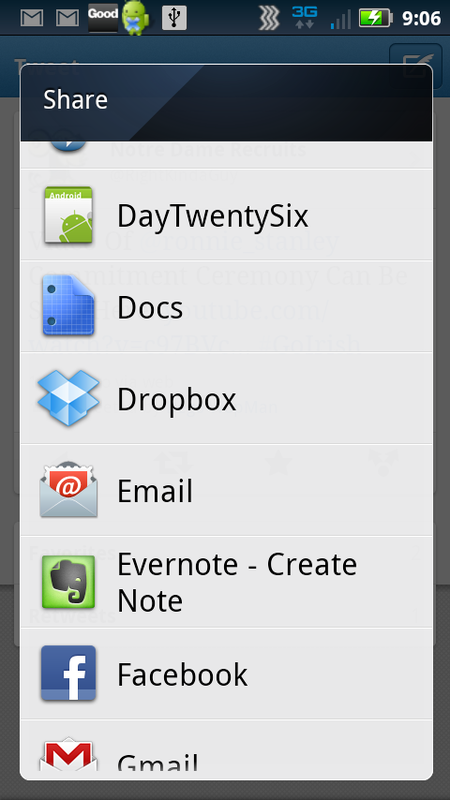 I truly believe that Intents are one of the most powerful parts of Android and really help differentiate it from iOS. Instead of all the apps being sandboxed, there is interconnectivity and ways to make things easier and more convenient for users. You can download the final code from the sample app here.